I 'discovered' Bob Dylan in my impressionable 1980s mid-teens after seeing the D.A. Pennebaker documentary film Don't Look Back. (see the all time classic Subterranean Homesick Blues via YouTube embedded below). I was impressed enough then to seek out more; even to go out and buy a few albums. So Chronicles : Volume One was an easy read for me. I think you have to have some interest to pick up this book, but you don't have to be a hard-core Dylan fan to enjoy the story as it's told. Bob Dylan seems to have lived an accelerated life; even to the extent of achieving his mid-life crisis in his twenties. We read here as much about his doubts and uncertainties as we do his output of songs and albums. New York's early '60s folk club scene is vividly brought to life; then the book makes thematically-based leaps, lurching forwards and backwards in time from there. There are extended dry periods when Dylan seeks motivation and is continually bewildered by the expectations of others. There are curious gaps in his recording work and similarly in his telling of it too. The recording of most of the great albums goes without a mention, then he singles out the New Orleans recording sessions for the 'Oh Mercy' album with Daniel Lanois in 1989 for particular scrutiny. 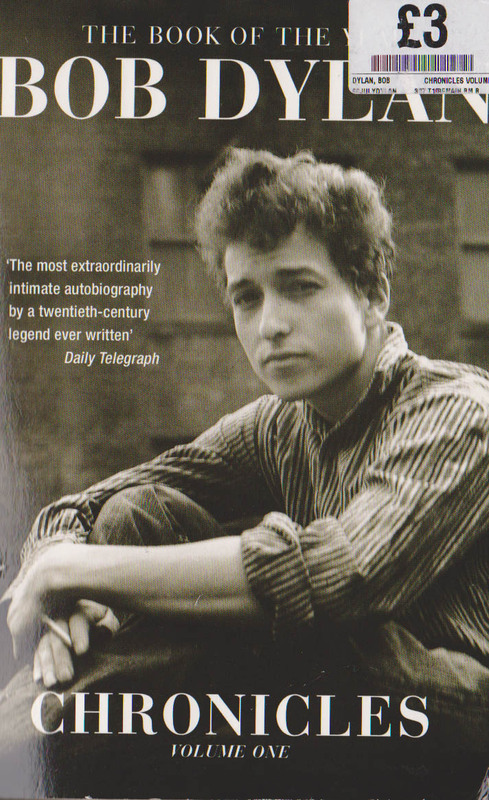 Chronicles is an eclectic and entirely subjective selection of moments from an extraordinary life: yet it's the process by which Dylan comes to his writing that emerges from the tangled-up reminiscences here. Here's a collection of my old 'college days' super 8 footage from the early 1990s. I've re-uploaded it to my YouTube Channel, because the quality of this now is so much better than it was with 2008 YouTube compression and low resolution settings I used previously... I mean, it was THREE whole years ago I first put this online. Fans of this blog. (erm... consider yourself to be one of a very small and select group in this respect) might notice I've just added FaceBook 'like' buttons to these posts. Go ahead, I invite you to try them out... You might also spot the comment button too... that has always been there (where it says 0 comments); but granted, it is easily over-looked. Well this IS very exciting! Two weeks ago I was hired by Canongate Books / Simon's Cat Ltd. to film the launch event for Simon Tofield's new book 'Kitten Chaos'. I shot lots of footage (and some stills) at the event and then spent around a week getting this edited down to this short web-friendly promo film. I'll probably post a bit more soon about shooting the event itself, but in the meantime, please enjoy the film embedded here from the Canongate Books YouTube channel. As I mentioned a few posts back, some fragmentary clips from this film can currently be seen in the music promo video for the new Lana Del Rey song Video Games. Now, I only wish there was a way of retrospectively improving the video quality of the old YouTube film. Three years ago, there was no HD option on YouTube only something called 'HQ mode' which seems to have been scrapped since then. I'm left with an online video only at 360P size which is very low-res indeed (and also horribly compressed). YouTube don't seem to offer any way of replacing an old clip like this apart from re-uploading and beginning again with no comments or hits etc. At TANDEM recently I was asked to make a promo video for the Police. A Learjet over to Sting's Tuscan villa? Well no, the client would be the UK Home Office, so instead I went to the M&C Saatchi offices in Golden Square to find out what it was all about. My enquiries revealed that the police forces up and down the UK are rolling out a new telephone response service for reporting 'non emergency' issues. The public are to be encouraged to use the number 101 for the types of calls which don't warrant the full emergency response of a 999 call. The police were asking for an on-line film to promote the new number and encourage the public to use it from now on. I directed, shot and composited the film in about three weeks with a couple of days compositing help from Chris Forrester at the end of the schedule. Due to all kinds of constraints, I decided the film could be made (almost) entirely with stills photography and After Effects compositing, so that's the way we went. I shot the film all with my Canon 600D camera, mostly using the Tokina 11-16mm wide angle zoom , but I also experimented with some of my dad's old Pentax mount lenses when shooting the panoramic cityscape shots at the start of the film.